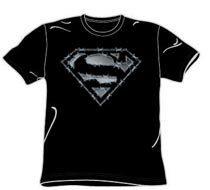 Famous, movie style, Superman Logo. 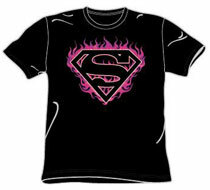 Printed on pre-shrunk, 100% cotton, adult size black tee. Adult sizes Small - 3XL. SM-268. 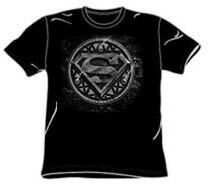 Large size Superman shield printed with Kryptonite Green "Glow in the Dark" ink. 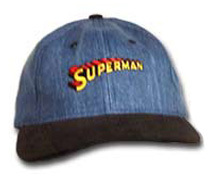 Wear this when fighting crime after work. 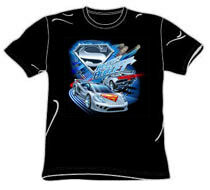 Pre-shrunk 100% cotton, adult tee. 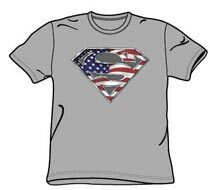 Only size XL left in stock. 23-331-277. Popular flame logo variation. 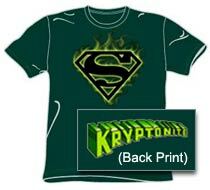 Superman shield enhanced with green flames. 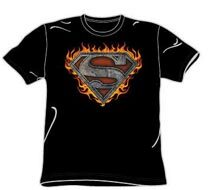 The word Kryptonite is printed across the back of the shirt. Pre-shrunk, 100% cotton, adult size Hunter Green Tee. 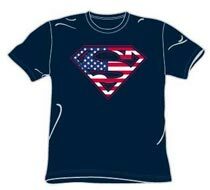 Only adult size Small left in stock. 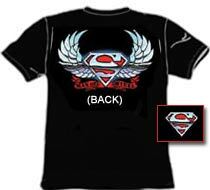 Superman variation with large motorcycle style "Wings" logo printed on the back. 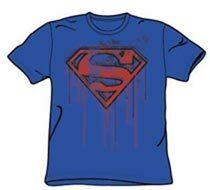 Superman red shield logo appears on right front. 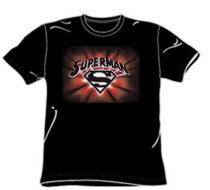 Printed on pre-shrunk, 100% cotton, adult size black tee. 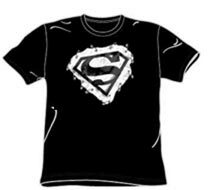 Only sizes Medium and 2X left in stock.